Sky Vegas is the casino of the BSkyB Corporation and part of the Sky family of igaming sites, which include sports betting, poker and bingo. With such a large company you can be sure that the game is safe, fair and not rigged at all. The games are independently audited so any cheating would be detected instantly. At Sky Vegas, you can play many types of online roulette. 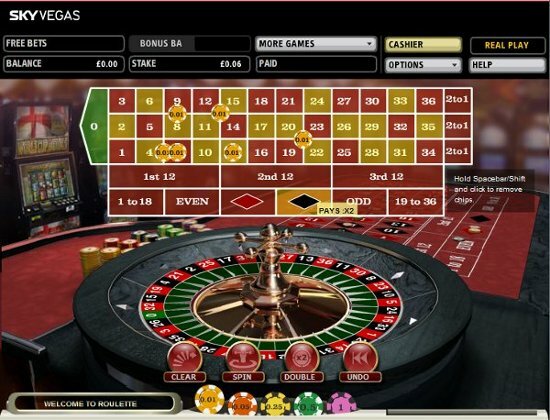 There is the classic European Roulette, high stakes and low stakes roulette (from just 1p) – for all forms of roulette players, and variants such as 3 wheel roulette, where three wheels spin at the same time. You can also play French Roulette, which includes bets such as Neighbours and French Bets; Double Bonus roulette, with extra bonuses and spins and there are also games which borrow from the principles of online roulette, but are slightly different. Games like this include Golden Clover, Lucky Star and Pinball Roulette; where the game is fundamentally the same as playing roulette, but the table is replaced with a pinball table. Online roulette at Sky Vegas is made more accessible and appealing with Sky Vegas’s no deposit welcome bonus. All new players who play online roulette at Sky Vegas will get a bonus of £10 when they register, without even having to deposit! There is also a welcome bonus of 200% up to £1000 available once you deposit and start playing more online roulette. Sign up to Sky Vegas for your £10 free and matched £1000 sign up bonus. If live roulette is your thing then sign up to Sky Casino’s live roulette. They have live roulette from 10p a spin with proper croupiers rather than the air powered roulette tables you see on other casinos.